polish insomniac: Dermelect Launchpad Update! 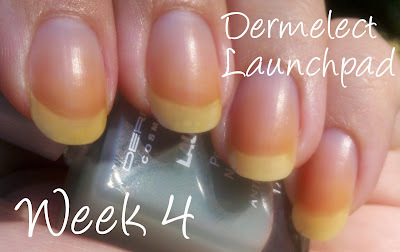 I have now been wearing Dermelect Launchpad for 21 days, and I must say I love it. Even though my nails are not yet extremely long, they are in SO much better shape! Can you see how wide the tips are? Normally by now I would have little nicks on each side making them more pointy than round. I still have to do a bit of preventative maintenance filing to grow out the damage that was already there, but I can tell it will be worth the wait! Here is what my nails looked like on day one, here after one full week. I have mentioned before that I do not have much patience, and I would never be able to do a base coat AND a treatment on a daily basis. I love that Launchpad does both for me! Can you see in the picture above how my stains are growing out? 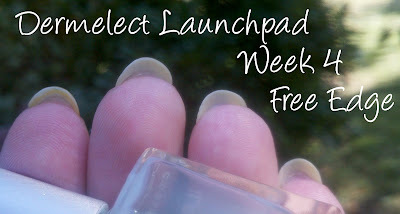 For a girl who mainly wears green, blue, and purple polish, I am surprised at how well the Launchpad actually prevents staining! This product was provided to me by Dermelect for review purposes. I am already planning my first order of Launchpad!